Today I’m sharing this outstanding editorial because it highlights the realities of living in a gun-crazy state – Florida. From the state that brought us the Trayvon Martin trial, we now have a new gun law. But it’s not the kind you’d think, like a bill to do away with “shoot first, ask questions later” aka "Stand-your-ground" law. No. The madness continues. Once again common sense is trumped by the gun culture in Florida. Florida is considered "accommodating" to guns, by national standards. This opinion piece addresses that fact. “U.S. federal courts have issued two noteworthy rulings on guns. One is constitutionally significant: It overturns the District of Columbia's ban on carrying handguns outside the home, while showcasing the gun-rights movement's aggressive legal and political efforts to eliminate virtually all regulation. It may go all the way to the Supreme Court, where the justices could potentially use it to establish ground rules for concealed and open carry. The other case has all the gravity of a Daffy Duck cartoon. It exposes an insular gun culture, addled by paranoia and determined to shut itself off from even the most anodyne expressions of common sense. A three-judge panel of the Court of Appeals for the 11th Circuit issued a split ruling reversing a federal court decision and upholding Florida's "gun gag" law, which prohibits -- sort of -- physicians from inquiring whether a patient has firearms in the home. The legislation is such a sloppy mess that it's impossible to tell exactly what it does and doesn't forbid. Now, two judges on the appeals panel have added to the legal buffoonery. "The Act seeks to protect patients’ privacy by restricting irrelevant inquiry and record-keeping by physicians regarding firearms," the ruling states. OK. Then it gets weird: "It is no exaggeration to state that a patient may be in some cases essentially at the mercy of his or her physician." In effect, the court ruled that when gun-owning adults are asked about firearm ownership by the race of superhumans known as doctors, they are powerless to resist. The case stemmed from anecdotes of gun owners taking umbrage at routine questions, including the rote variety that appear on standard questionnaires issued by some physician offices. 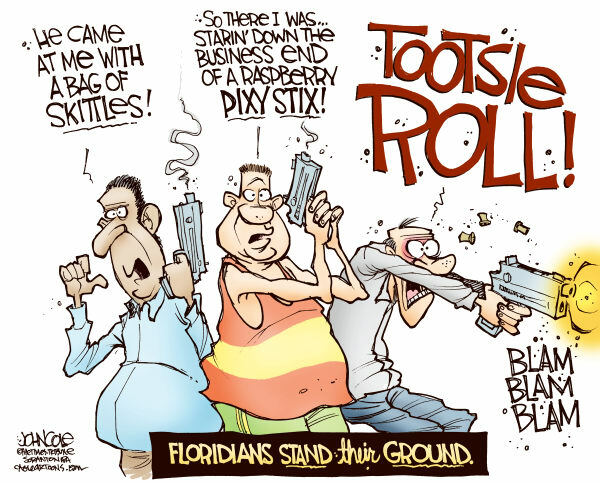 The emotional distress was so intense that the National Rifle Association begged the Florida legislature to intervene. Why do these nosy docbots want to know about firearm ownership, anyway? For the same reason they ask about drug and alcohol use and the storage of poisons in homes with small children: They prefer living patients to dead ones. And 30,000 times a year in the U.S., a firearm doesn't just reduce a patient's life expectancy, it eliminates it. Earlier this month, a Florida three-year-old shot herself in the stomach with a loaded, unsecured gun in her home. As a lengthy dissent, written by a flabbergasted Justice Charles Wilson, stated: "A vivid imagination is not required to think of the innumerable adverse health consequences that go along with unsafe firearm ownership." Doctors could continue asking about firearm ownership in cases in which such a question was "relevant" to a patient's care. When is it relevant? No one, least of all Florida legislators or doctors, appears to know. Physicians challenged the law on grounds that it's both unconstitutionally vague and a blatant, four-alarm abridgment of free speech (let alone professional responsibilities). But put aside the subjugation of the First Amendment to the Second, and other constitutional issues. How did a modest, discrete effort to limit morbidity and mortality ever inspire such an overblown reaction in the first place? You can contact the writer, Francis Wilkinson at fwilkinson1@bloomberg.net. This article originally ran in Forbes.